P-2795. 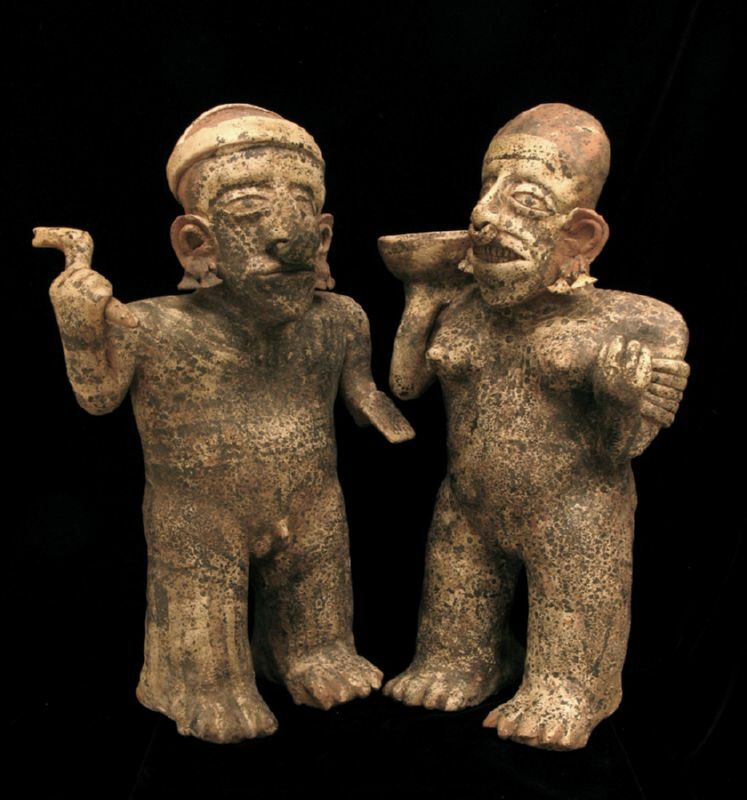 AN EXCEEDINGLY RARE NAYARIT MALE & FEMALE POLYCHROME PAIR WITH WHITE SLIP DECORATION, IXTLAN DEL RIO VARIANT STYLE, PROTOCLASSIC, CA. 100 B.C. to A.D. 250. Heights: The male is 17 inches (43.2 cm. ); the female is also 17 in. Provenance: From an Arizona Private Collection of Pre-Columbian Art formed during the 1960s. This intricately sculpted pair was obviously executed by the same hand. The white slip is practically non-existent among known Nayarit examples of large pairs. The beautiful surface’s white slip is complemented by red and black pigments, and is enriched overall by the copious black mottling of manganese oxide deposits. The male has deep-set eyes within realistic lids beneath a strong brow. He sports complex earrings and a nose ornament representing a carved seashell. He has heavily tattooed designs from his face to his toes. His headdress has a solid background of red pigment against white bands. He is holding a club featuring a bird’s head in his right hand, and a small shield in his left. The female has similar surface designs and is holding a bowl in her right hand. Both pieces exude a powerful expression of unity.